You've got me wonton more! Happy Lunar New Year! Wishing you all happiness, prosperity and good health. Soup noodles is all my time favourite comfort food and wonton noodles is without a doubt one of the most classic Chinese noodle soups. 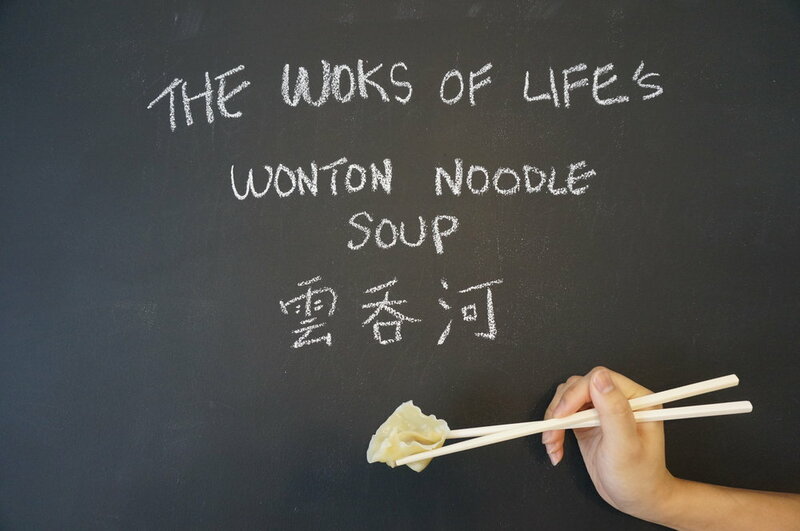 We've modified Woks of Life's recipe a bit, substituting egg noodles with rice noodles. I've always preferred the smooth, soup soaking goodness of rice noodles over the chewy texture of egg noodles. The recipe calls for whipping the meat mixture by hand for 15 minutes or by food processor for 5 minutes. Obviously I opted for the less labour intensive option. After blitzing the meat for 5 minutes, it turned into this pink smoothie paste, similar to the pictures online of uncooked nuggets before they are shaped. Folding the wonton was the most fun part of the recipe. I've considered myself a bit better at more detail oriented tasks, which is why mine turned out much neater. Sorry Robyn, your wontons were "loose", someone else's word, not mine. The wontons turned out delicious and it was much easier to make than I thought. We will definitely make these again. 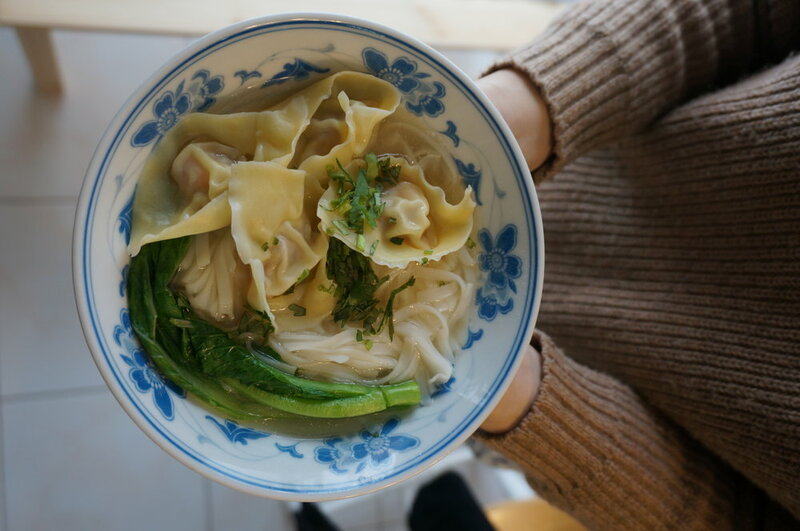 Wontons are one of those foods that are so easy to buy frozen and you wouldn't think much about making it from scratch but trust me, this recipe is so simple and delicious that you'll say goodbye to the days of buying prepackaged wontons. PS: I think my Chinese writing wasn't actually bad but...we do hold chopsticks incorrectly. Start by making the filling. Add the pork, salt, sugar, sesame oil, white ground pepper, wine, oil, water, and cornstarch to a bowl and whip everything together by hand for 15 minutes, or in a food processor for 5 minutes. You want the pork to look like a paste. Mix in the chopped shrimp. 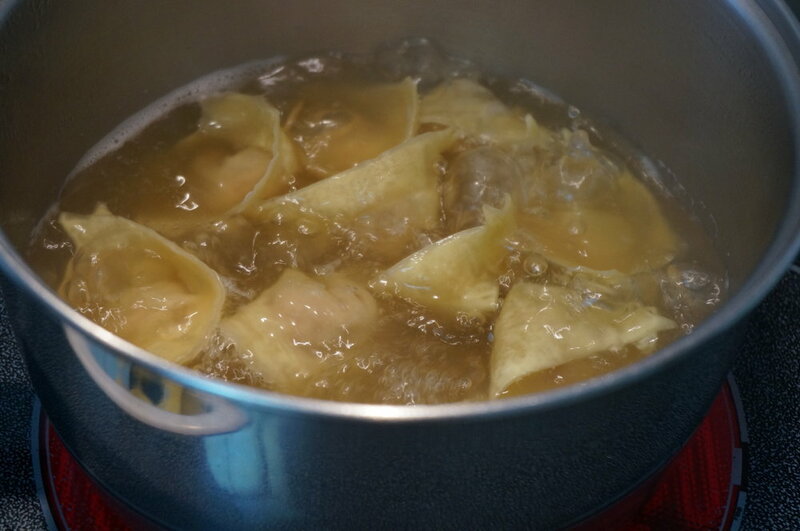 To make the wontons, take a wrapper, and add only about a teaspoon of filling. Use your finger to coat the edges with water (this helps the two sides seal together), and fold in half so you have a triangle shape. Bring together the two outer corners, and press to seal. 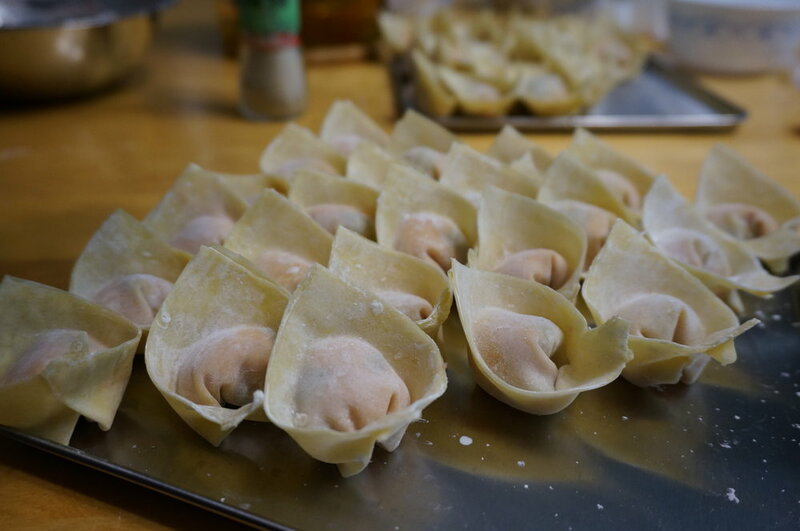 Continue assembling until you've used up the filling (this recipe should make about 3 dozen wontons). Heat up the chicken broth in a medium pot. Bring another large pot of water to a boil and cook the noodles according to instruction. Afterwards, cook the wontons for about 4-5 minutes until they float and the filling is cooked through. 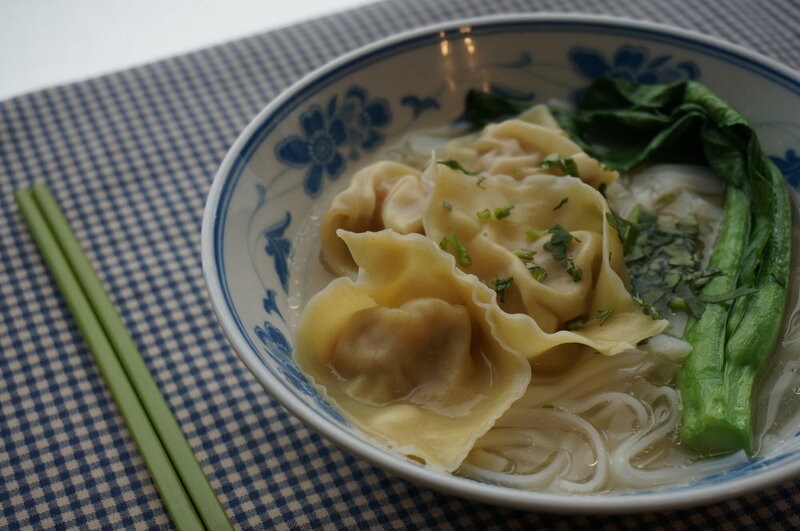 Divide wontons and noodles among the bowls, and cover with hot broth. Top your soup with a couple drops of sesame oil, chopped scallion, and white pepper.